South Korea's Kim Woo-jin set a world record in the men's 90-meter recurve archery at a local competition on Friday. 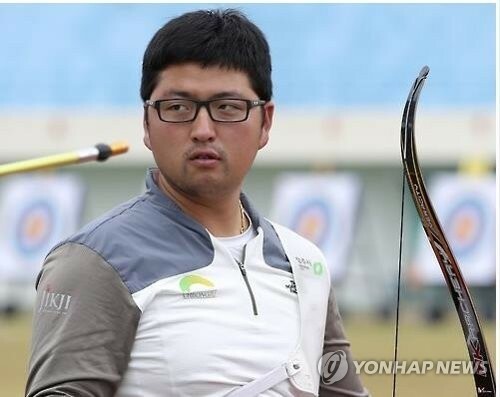 Kim, 25, scored 343 points out of a possible 360 in the preliminary round of the 49th National All-Star Archery Tournament at Jinho International Archery Center in Yecheon, North Gyeongsang Province, beating the previous record set by his compatriot Oh Jin-hyek in 2009 by one point. The South Korean event is sanctioned by World Archery, the sport's international governing body, and Kim's record will be soon approved as the world record. Kim, the 2016 Rio de Janeiro Olympic gold medalist in the men's team recurve, topped the preliminary round with his performance. He marked a combined score of 1,390 points in the 1440 Round after shooting 36 arrows at each of 90m, 70m, 50m and 30m, just one point shy of his own world record set in 2014.